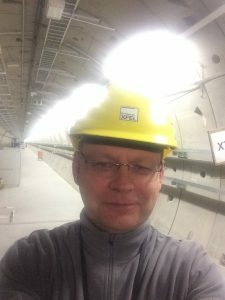 Dr. Tom Heinzl visited the DESY XFEL in April. This is a 1.5 million Euro X-ray free electron laser, situated in a 3 km long tunnel near Hamburg, Germany. It has just seen “first light” on 4th May (see http://www.xfel.eu). Tom attended a meeting of the HIBEF User Consortium (see https://indico.desy.de/conferenceDisplay.py?confId=16772), where he gave a talk on “Light-by-light scattering” This is a classically forbidden process that only becomes possible in quantum theory due to particle-anti-particle fluctuations of the vacuum. 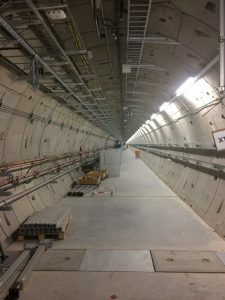 A variant of this process has recently been observed in heavy ion collisions at CERN (http://cerncourier.com/cws/article/cern/66878). The HIBEF facility combines the DESY XFEL with high-power optical lasers. Such a unique combination may allow the first detection of light-by-light scattering in a purely electromagnetic setting (without recourse to high-energy matter particles such as heavy ions). Tom and collaborators at Plymouth University, Anton Ilderton and Ben King, are providing theory support for the HIBEF experimentalists who want to perform this fundamental physics experiment. Previous Previous post: Visit to the University of Bucharest.